Philadelphia Flyers goaltender Brian Elliott (37) and center Scott Laughton (21) celebrate their win over the Tampa Bay Lightning. 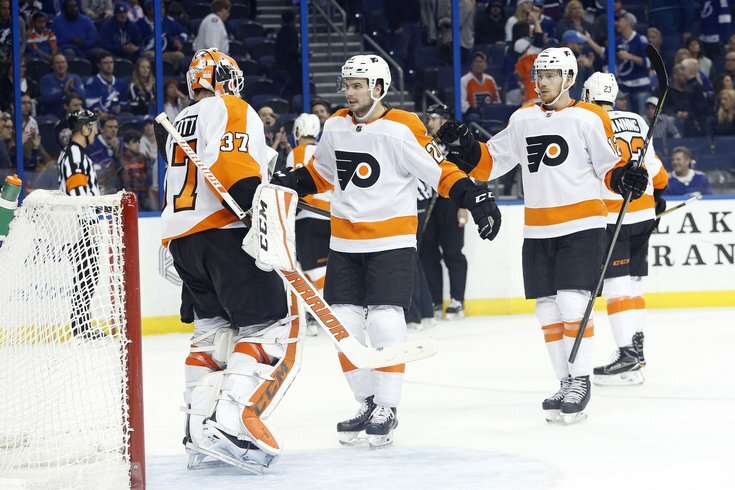 The Flyers proved something Friday night that they actually knew about themselves before playing the NHL’s best team, the Tampa Bay Lightning: They can play with anyone in the league. The night before, in Florida, the Flyers also confirmed something about themselves: They can lose to any team in the league. Will recent line changes add consistent energy to the Flyers? Are Philly sports still cursed, or are we just that unlucky? In 2018, it may be an idea for the team to make a collective resolution to stop tripping over itself and play the way its capable. The Flyers are easily the most enigmatic team in the city and in the NHL. One night, they look spectacular in beating Tampa Bay, while other nights they’ve had wretched efforts like they had against Buffalo and Florida. In the Flyers’ 5-3 win over the Lightning, everyone was involved. Sean Couturier had a goal and two assists. Claude Giroux assisted on three of the Flyers’ five goals. Defenseman Shayne Gostisbehere set the offense on the power play, and scored a goal, forward Travis Konecny was a difference-maker with two assists, and Wayne Simmonds and Jake Voracek were nightmares around the net for Tampa Bay defenseman Victor Hedman, considered one of the NHL’s best who was on the ice for three of the Flyers’ five goals. Defenseman Robert Hagg was a force and continues to blossom, while goaltender Brian Elliott logged yet another solid games. Elliott’s glove save on Nikita Kucherov storming down the right wing with 18:40 left in the game has been typical. That victory was followed with the usual head-scratching the Flyers have caused this season. Where has this team been? Why haven’t the Flyers played like more frequently? Back on November 2, the Flyers went to St. Louis, which at the time was 10-2 and had the best record in the NHL. The Flyers came away with a 2-0 victory. Two nights later, against the visiting Colorado Avalanche, they lost 5-4 in a shootout, to a team that had just traveled across the country. More recently, they lost at Buffalo, the worst team in the NHL and, to a man, admittedly came out listless, then battled a very good Columbus Blue Jackets team in dropping a 2-1 shootout decision. This week it was more of the same, losing to Florida in a game in which the Flyers’ energy level didn’t pick up until midway through the second period, followed by the inspired 5-3 effort against an elite team like Tampa Bay. Coach Dave Hakstol has shouldered some of the blame, though the majority of it may rest with the players themselves, and possibly the leadership. The Flyers play to their opponent. They appear to save their legs for the better teams and glide by and expect to win against struggling teams. What’s more mind-boggling is that they seem to know it. Tampa Bay had only lost twice at home prior to the Flyers beating them Friday night. There was this feeling that at any time the Lightning would explode, but they didn’t. Why they can't battle at that level on a nightly basis remains anyone's guess.